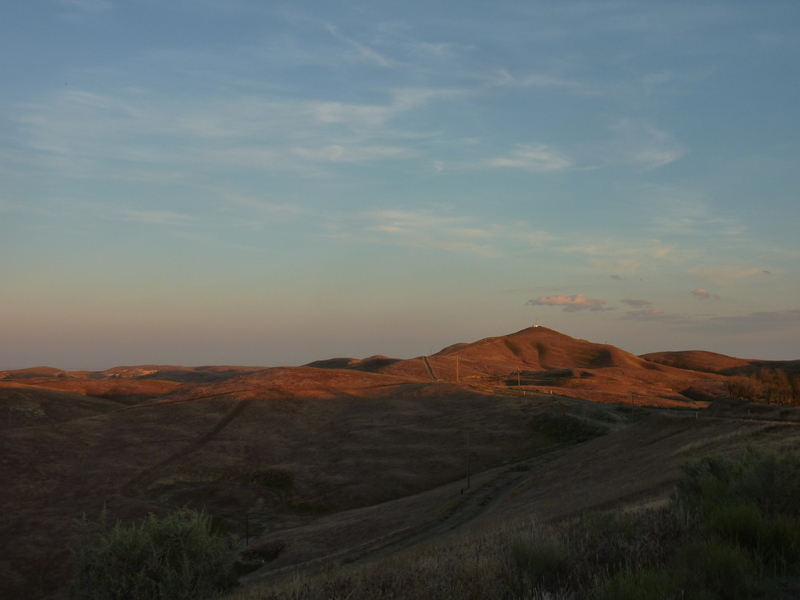 The Kettleman Hills, named and misspelled after Dave Kettelman who ranched cattle in the area in the 1860s, is a low collection of hills at the southernmost end of the Diablo Range. Almost entirely grass-covered, there isn't a tree to be seen in this desert range that sees scorching temperatures in the height of summer. The hills run parallel to Interstate 5 and SR33, separating the Central Valley from the much smaller Kettleman Plain to the west. Oil was first discovered here in the 1920s, peaked at 29 million barrels in 1936, and has since fallen to a very small fraction of that today. Fracking and other enhanced recovery techniques did not prove viable in these fields and the area missed much of the recent fracking boom (and bust) that was seen elsewhere in the state. Much of the hills are owned by Chevron and have the look of neglect and decay. From an aesthetic and environmental standpoint, the area has been poorly managed, with old equipment, abandoned buildings and the like left haphazardly all over the place. SR269 runs from I-5 to Avenal (originally a oil boom town, now a state prison town) at the north end of the range. Skyline Rd southeast from the highway along the spine of the range, poorly paved but still drivable by any vehicle. Signs at the highway indicate the road is private but do not expressly forbid trespassing (hunting/shooting prohibited, permission to pass revocable at any time). There is an old oil well derrick found at the junction, a monument to more profitable times. There are 50 named summits in this small range, though only the highpoint, La Cima, has more than 200ft of prominence. Most of the summits are minor bumps named for ordinary items in spanish, such as cob, bump, thumb, etc. La Cima itself means merely, "The Summit". This was my primary target, about 4mi along Skyline Rd. The other four summits I visited were mere bonuses, found just off the road on my way back. On my way south to Frasier Park in the northwest corner of Los Angeles County, I didn't get to the area until shortly before sunset, so only the first peak had much daylight for photos. It grew progressively darker before I returned to SR269. I'm not positive, but I suspect that a motivated person with free access to the area could maximize the number of named summits attained in a single day within CA. I'm not going to be that person, however.